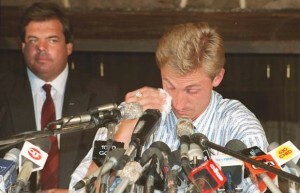 August 9, 1988 was a day that changed the face of sports forever…because it was the day Wayne Gretzky was dealt from the larger-than-life Edmonton Oilers to the meaningless Los Angeles Kings. That Tuesday morning, I arrived at my CBC Network Sports office in Toronto a little late (just like every day) and plunked myself down with my feet on my desk. Many who worked on the fifth floor of that building on the east side of Yonge Street, just north of Gerrard, were in Seoul, South Korea. There to produce CBC’s coverage of the XXIV Olympic Summer Games. You know, the “Ben Johnson Games.” I stayed in Toronto to produce our CFL on CBC coverage, which continued during those months. With so many gone, our offices were a lot like a ghost town. Then my phone rang. My job that week was to edit a feature about newly signed Ottawa Rough Riders’ quarterback Art Schlichter. The former Ohio State star had bombed out in the NFL after gambling overtook his life. He was trying desperately to remain in professional football in the Canadian League. He lasted half-a-season in the CFL. At this moment in 2013, the 53-year old Schlichter appears to be in prison. Doctors have said his years-long impulsive behaviour could be a result of more than a dozen football-related concussions suffered in high school and college. Schlichter has signed papers that will see his brain and spinal cord donated to Boston University upon his death. Back to the phone call. On the other end was a buddy of mine from TSN, which had only been on the air about four years at the time. Back then, Paul Hemming was an editorial assistant. Today, he directs TSN’s CFL broadcasts. He has directed the Grey Cup telecasts for the past five years. Does a great job. But, that day, he simply said, “Hey, Steve-o, how’s it going? Looks like Wayne Gretzky has been traded.” I was quiet for a moment, and then said something exquisitely simply like, “You’re full of s—t, Hemming.” Seems he was not. He said, “Nope, seriously. Here’s the deal.” Then he started naming names that were part of the trade. I grabbed a tiny piece of white paper from a CBC notepad on my desk and started scribbling in pencil. That note is to the left. I used short forms for all names – a carryover from my days as a stats guy, working in the broadcast booth at Northlands Coliseum in Edmonton. And also note that I spelled Martin Gelinas’ name wrong (adding an erroneous “i” near the end) – a testament to his lack of notoriety at that point. After all, he had only been drafted seventh overall by the Kings less than a month earlier. Then Hemming blurted, “Gotta go get more details.” He hung up the phone and I didn’t say a word. I just sat there at my desk. My office wasn’t huge, maybe eight feet square, and I had a Foster’s beer poster stuck on the wall opposite where I sat. I just stared at it. It felt like forever, but I probably stared for two or three minutes. I had no idea what to think. I got up and wandered the few feet into the reception area of our offices. I asked the receptionist, Jill, if anything had come over the wire about Gretzky and a trade. Almost at that very minute, bells started going off and faxes began coming in confirming Oilers’ fans worst fears. Gretzky and Oilers' owner Peter Pocklington celebrate Wayne's 1,050th career NHL assist to become the NHL's all-time assist leader. 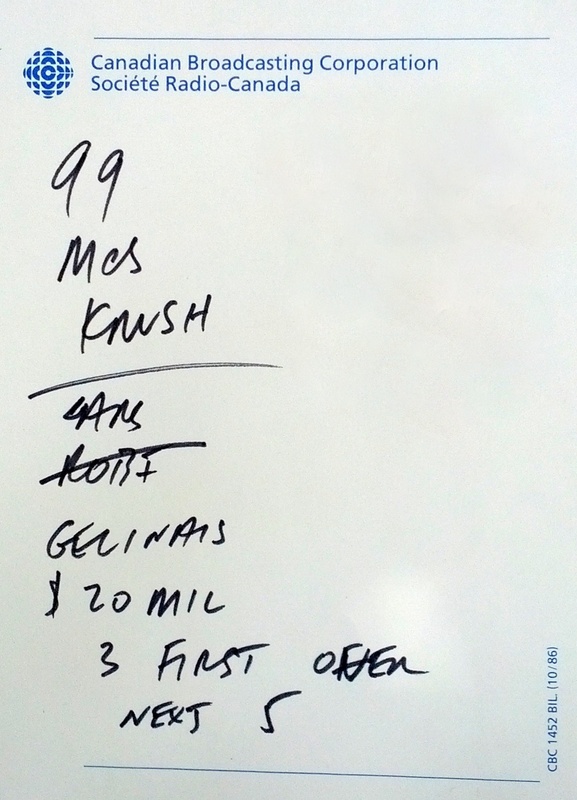 Five months later, Gretzky would be off to Los Angeles. To this day, when I think about the trade, I get a sick, empty feeling in my stomach. As if something horrible has happened and I’m powerless to stop it. Last month, I was in Edmonton with my family and we drove past Molson House (where the Gretzky press conference was held the morning he was dealt). I wanted to show my son this landmark. It was gone. Apparently, a few years ago, it was moved in its entirety, to a remote location outside Edmonton. Gretzky has retired. So have all the players involved in the deal. The Kings don’t play at the Great Western Forum anymore. In a couple years, the Oilers will vacate Rexall Place. Clearly, a lot of time has passed since that shocking day in 1988. 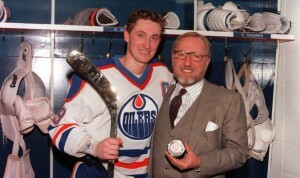 That doesn’t mean the feelings and anger and betrayal felt by many Oilers’ and Gretzky fans has gone away. I feel it exactly the same today as I did twenty-five years ago. He smiled and said “It’ll never blow over.” And here we are. Boy, Marty sure hit the nail on the head that day. Frankly, there’s nothing that could happen in the 2013 sports world that could even come close to the magnitude of that deal. I was working at Endako Mines in Northern B.C. A guy in the warehouse kept giving me updates on thre rumors. Then the big news came. We talked about the trade more than about our work the rest of the week.